When starting out dairy free the first thing you’ll want to know is how to replace the main dairy products. So what are the alternatives for the main dairy products i.e. milk, cheese, yogurt, butter, cream and ice-cream? When my parents had to find dairy alternatives for my little sister in the 1980’s, choices were very limited but now you can even find one or two dairy free options in the local petrol station or corner shop. Along with a wide variety of dairy free milks there are plenty of dairy free spreads to replace butter, alternative yogurts and even options for cheese and ice-cream lovers! For baby formula there are many options available for cow’s milk allergies there are various protein hydrolysed formulas and for lactose intolerance there are lactose free ones. Some are available off the shelf and some are prescription only. For babies advice should be sought from a health professional regarding the best dairy free formula for them. At 1 my son was on SMA Wysoy, a soya based formula and Alpro soya junior 1+ for his cereal and sippy cup drinks. Since the boys were 2ish (aged 4 and 7 now) they mostly use soya milk, and sometimes almond or almond & coconut mix. For Soya, Alpro seem to have the widest variety, they have unsweetened which is good for cooking and baking, a light version, a junior 1+ version marketed as a follow on type milk for toddlers moving off formula, and the original one in the blue packaging as well as chocolate and strawberry versions and many others. There are also many other brands of soya milk including Tesco own-brand and Aldi own- brand. Many of them come in both a fresh milk version which can be found in the fridge and has a use by of a few weeks, and a longlife version on the ‘free from’ shelf which will last for months. The fresh versions are on average 50c cheaper than the long life ones. Other options for milk alternatives include rice milk, almond milk, hemp milk, coconut milk, hazelnut milk and oat milk. Many of these are available in supermarkets, with a wider variety in health stores. There are a number of dairy free cheese alternatives but it can be difficult to source them. Locally, Violife has been the easiest to source and they do a range of different ones – slices, grated, meltable cheese for pizzas and a soft cheese. You can find it in Dunnes Stores and health stores. For the lactose intolerant, LactoFree do a lactose free block of cheese. The options for yogurt tend to be mainly soya based and are available in Dunnes Stores, Tesco and SuperValu. Alpro do a big range of soya yoghurts – forest fruits, raspberry, blackberry, peach, exotic, plain, vanilla and no bits peach & pear and strawberry & banana. They also do 500ml pots of plain, plain with coconut and plain with almond. These are great for smoothies or for cooking with! Tesco also do their own brand soya yogurts and my boys give them a big thumbs up. 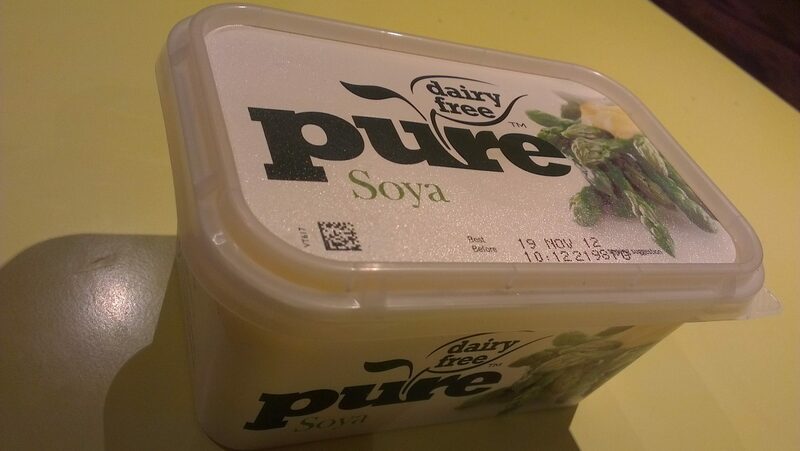 If you want a soya and dairy alternative then Wot No Dairy is a pea protein based yogurt and Coyo is coconut based. These can be found in health stores. The new Pure dairy free spread range tastes good and is easy to find in all my local supermarkets. There are three options olive, soya and sunflower. Olive is my favourite. There are soy based cream alternatives and coconut based ones. The soy one is like a single cream, it is not possible to whip it to make it thick. Ice cream is a big one in our house. I have nearly felt like crying on more than one occasion when we’ve been somewhere and somebody buys ice cream for the children or starts giving out ice-cream as a dessert and I watch one or both children’s little faces fall as they know they can’t have any. Or I see photos of kids on days out having a big ice-cream cone, or we read in a library book about holidays that ice-cream at the seaside is one of the best things about holidays. There are a few dairy free options which is wonderful and as long as I’m super organised I can save my child from being upset at these moments. Occasionally reasoning with him that he can have some when we get home has been enough to save the day too. And of course fruit ice pops are sometimes ok but not always as easy to find dairy free ones as you might think. Swedish Glace do a lovely range of non-dairy desserts including vanilla, raspberry, chocolate and strawberry. These are usually available in SuperValu and Dunnes Stores. nobó is a delicious range of dairy free frozen goodness from a small Irish company. Their ice-creams are made with cocnut milk and they are truly delicious. My favourite of the dairy free options around. The Salted Caramel flavour is to die for. These can be found in SuperValu and health shops nationwide. 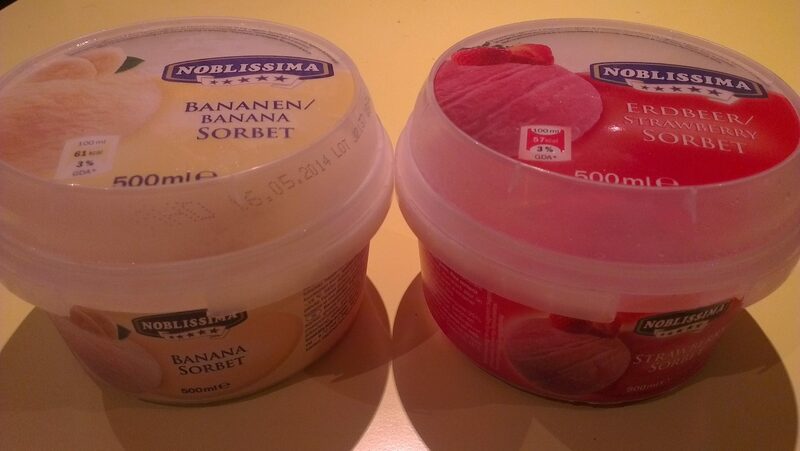 Lidl do a range of Noblissima sorbets which are dairy free, and I defy you to find a 3 or 4 year old that will know the difference between it and ice-cream. These were a life saver when we were on holidays in France this year, as my little boy was able to have ice-cream every day on holidays just like his library book had said. What’s on your basic dairy free shopping list? I can’t thank you enough for this shopping list! It will make things so much easier. oh and just to say I found Violife cheese at Morrisons last night. And our Morrisons is definitely not one of the larger stores. Just in case anyone didn’t know. Not sure if people are aware but the Lactofree milk actually contains 0.03% of lactose, as I found out to my cost. So if you suffer with even the slightest amount of lactose, don’t use Lactofree milk. Hi Cathy, thanks for sharing this, I will look into it further. This is just what I was looking for. I am dairy free and taking my first trip to Ireland this summer. We’ll be staying at B&Bs and eating out for other meals. Would be reasonable to ask hosts to provide almond milk (for example) or should I plan to pickup my own supply and tote it from fridge to fridge? I’d buy my own long shelf life plant milk. The owners of b&b are usually very nice and accommodating but often people don’t really understand your concerns. So you could get say soya milk but your fries (Irish breakfast) may be fried in butter. Try to explain before you come and after you arrive and check just before you eat it. Just in case, so you won’t ruin your holidays.